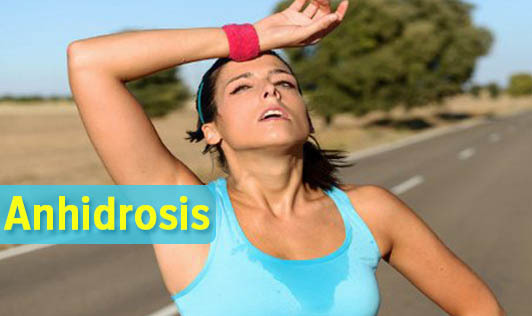 Anhidrosis, sometimes referred to as hypohidrosis, sudomotor dysfunction or sweating dysfunction is an abnormal lack of sweat in response to heat. This means a person's body is unable to sweat normally. If the human body cannot sweat properly then it cannot cool itself, which is quite harmful. Sweating allows heat to be released from the body. • Abnormally poor sweating in response to heat or exertion and in some cases, no sweating at all. The sweat glands stop functioning for a number of reasons such as nerve damage to the skin or trauma. The condition may also be inherited or can be caused by a genetic disorder that makes the sweat glands malfunction. Anhidrosis also develops as a side effect to medications including those used to treat bladder control, elevated blood pressure or psychiatric conditions. The treatment usually focuses on making lifestyle changes such as staying in air conditioned environment when it's hot outside, wearing loose clothing and avoiding anything more than moderate exertion. Contact your doctor if you have a general lack of sweating or abnormal lack of sweating when exposed to heat or strenuous exercise!